I was introduced to ramen noodles fairly late in life as far as I’m concerned. Nonetheless, I’ve been making up for it by trying different restaurants offering this hearty Japanese soup. There has been a ramen-boom in RI and Massachusetts relatively recently and new restaurants are popping up more than ever. I’m not sure why New England is latching on to Ramen lately, but it may have to do with Vietnamese pho restaurants paving the way and refining our New England palettes. While pho and ramen are both large bowls of soup worthy as a meal in their own right, ramen is as distinct in flavor from pho as Japanese culture is from Vietnamese. Ken’s Ramen is a fairly new addition to Providence’s downtown landscape having opened in early 2014. Since the opening, I’ve had the opportunity to eat at Ken’s twice. Each time I tried a different kind of ramen. Both were pretty excellent although very different. 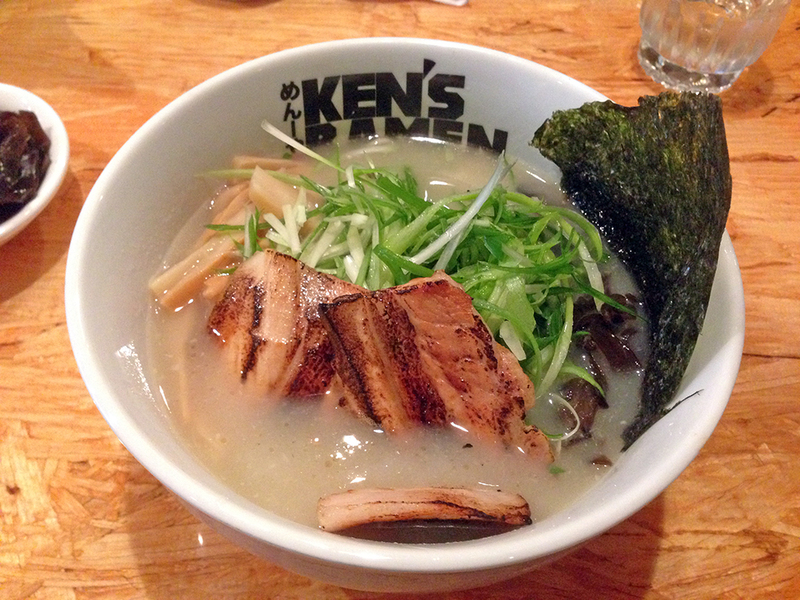 As a small restaurant, Ken’s offers a pretty good variety of ramen styles considering that some ramen restaurants only offer one kind of ramen. The first thing you’ll notice when you walk up to Ken’s is… nothing at all. 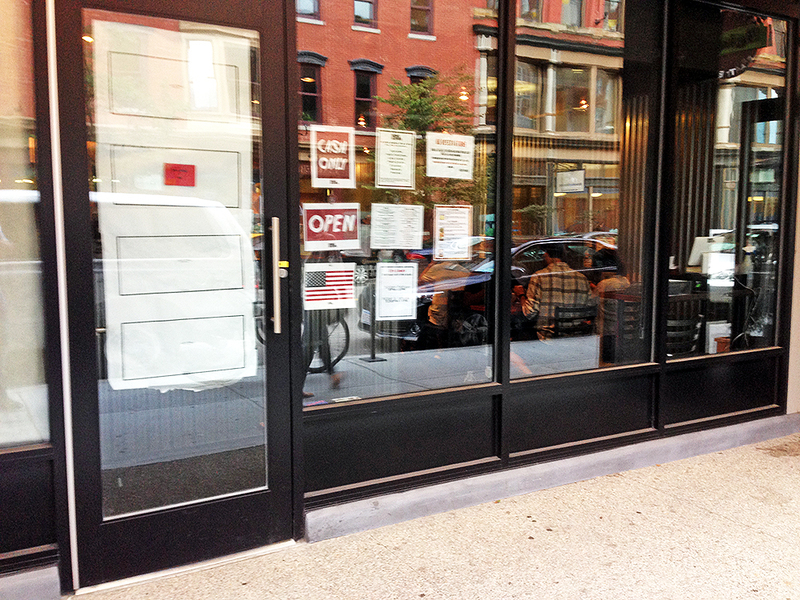 As of the time of this post, there is no clear signage for the restaurant and the paper over the doors and windows makes the restaurant look like it’s not open for business. Nonetheless, if you trust the address, you’ll find it. In contrast, the interior of the small restaurant is very nice yet practical. Half of the seating is at the bar, while the other half is at tables. I’ve never sat anywhere other than the bar myself. The rest of the restaurant is devoted to the open kitchen where people can watch as their food is made fresh. It’s always a little crowded at Ken’s due to the limited seating area and the fact that people come in droves as soon as the restaurant is open for the day. The service is always very friendly and the servers are always willing to help you out with any questions you might have about the menu. Often, Ken himself is walking around making sure customers are satisfied and that everything is going smoothly. Obviously, you should get ramen when visiting a ramen restaurant. 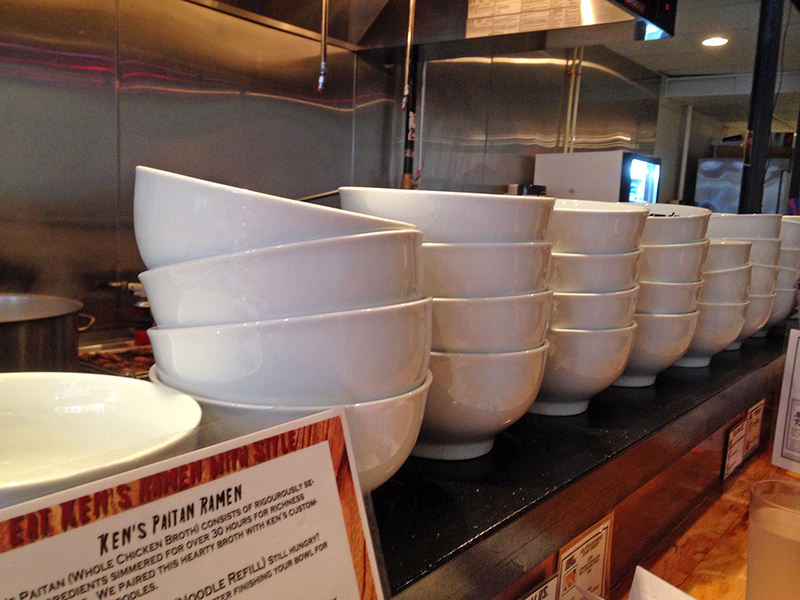 Nonetheless, Ken’s Ramen offers a variety of side dishes and even different kinds of ramen. 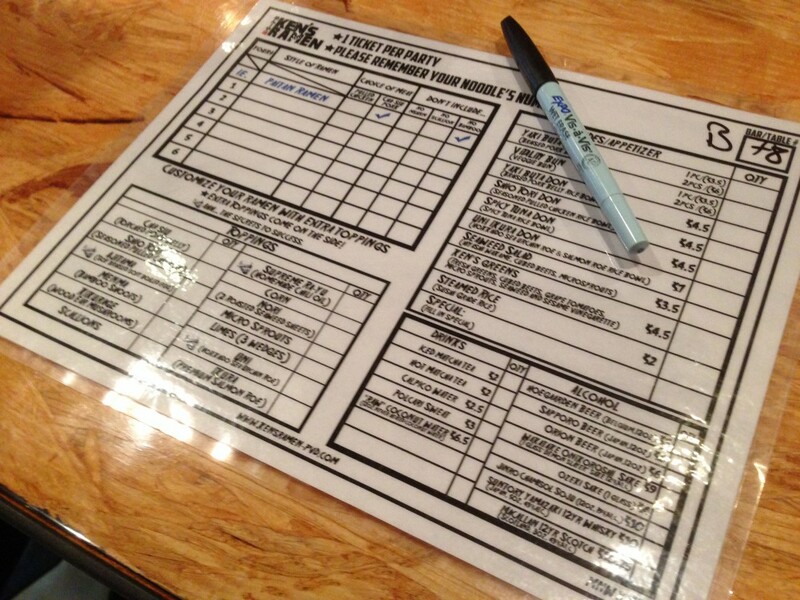 The menu isn’t overly large and ordering can be a little confusing the first time due to the dry-erase menu you fill out to order, but once you know what you’re doing, it’s easy enough. Below, I describe the pork bun side dish and two different kinds of ramen. 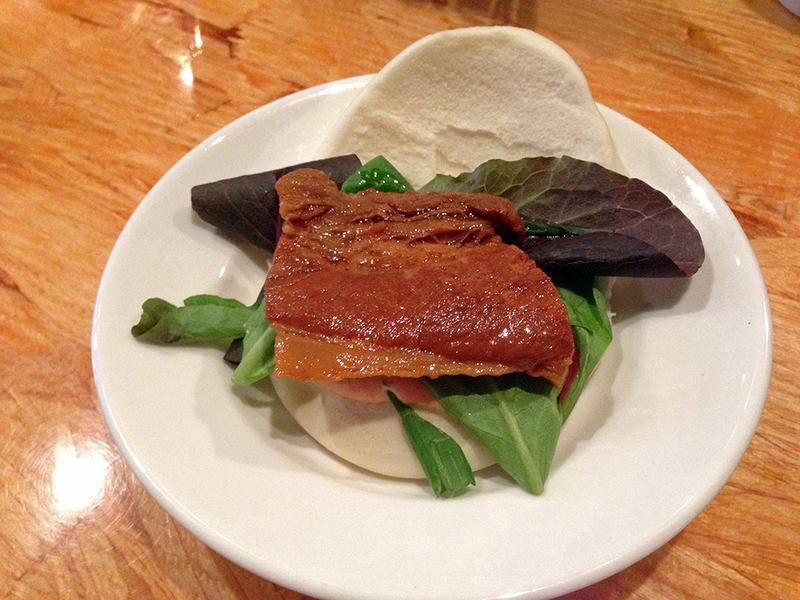 Yaki Buta Pork Bun (Braised Pork Belly Bun) – The first thing that caught my eye from the “Sides” menu was a braised pork belly bun. A bun is a puffy piece of rice flour bread that is pretty bland on its own, but when paired with a sweet and/or tangy filling, provides a balanced flavor. The pork bun at Ken’s came as a generous portion of pork belly compared to some others I’ve had. The pork belly preparation included a sweet braise, which went well with the tender pork. The greens provided some bitterness and the bun itself mediated all of the flavors. The most surprising part of the pork bun was the “Ken’s Spread,” which is basically some kind of play on Thousand Island dressing similar to that on a certain infamous double-decker fast food burger. I’m on the fence regarding the spread because I’m not sure if it added something to the bun or distracted from the other great flavors. On the other hand, one of my friends loved it so much that he almost ordered another before even getting his ramen. Pork belly itself isn’t for everyone, especially when it is a tender preparation as opposed to a crispy one, but if you enjoy pork belly, I would recommend giving this bun a try. Ken’s Paitan Ramen – On my first visit to Ken’s I went for the more traditional ramen option by choosing the Paitan Ramen. This ramen came with a broth “simmered for over 30 hours” using whole chicken. Nonetheless, the broth was fairly light (in color and density) compared to some other ramen broths I’ve had, which is a good thing. While waiting for the ramen to arrive, I had the chance to witness some of the kitchen staff char the pork pieces that come with the ramen if you choose that instead of chicken. I will admit that I was a little apprehensive about how the pork was prepared. 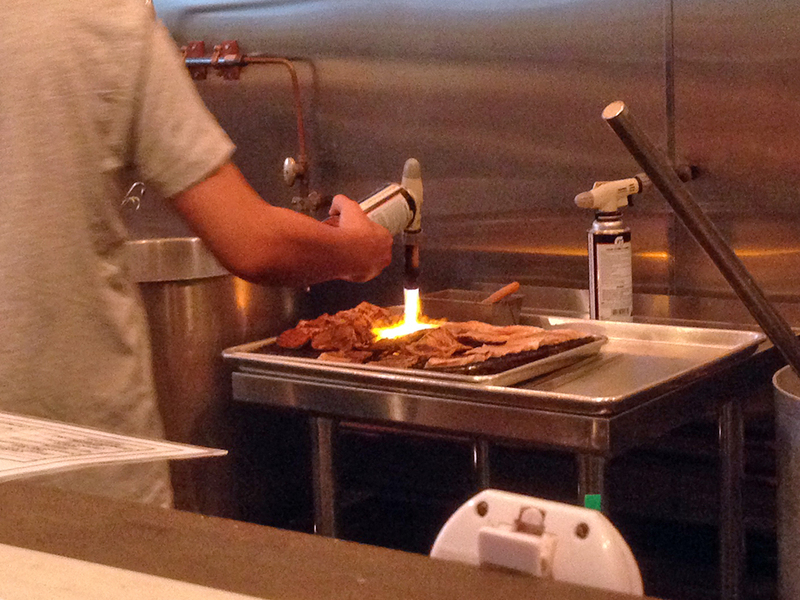 It was charred using a blow torch (which is kind of awesome), but the pork itself was just sitting on the side waiting for the ramen. I just wasn’t sure if the pork would be good. I needn’t have worried though because the pork was absolutely delicious. It was firm, but not chewy and held up to the broth by adding flavor instead of getting lost in it. Every bite was a pleasure and I found myself saving a piece so that I could have some at the end of the meal! The mix of vegetables in the broth along with the noodles created a very tasty bowl of soup. My only qualm with this dish would be the noodles themselves. I thought they tasted good, but they aren’t the kind of noodles I would want for ramen in general. The Paitan uses a thinner noodle that doesn’t have as much weight and isn’t as wonderfully toothsome as other noodles I’ve had. If I could order this bowl of ramen with the noodles offered in the Tsukemen (see below), then I would immediately give that a try. I can understand why Ken’s chooses to use these thinner noodles for the Paitan ramen considering that it is a lighter broth. Ken’s Tsukemen – I tried the Tsukemen the second time I went to Ken’s because the Paitan ramen wasn’t available. I’m not sure why it wasn’t ready around lunch time, but that is what happens sometimes when food is made fresh and the timing doesn’t always line up with service. I wasn’t discouraged though because I was willing to try something different. The Tsukemen is a completely different kind of dish from the usual ramen most people see at restaurants in New England. It comes in two bowls with one bowl containing the awesome custom yellow noodles and the other bowl containing a richly thick version of their chicken broth. The yellow noodles are the kinds of noodles I’m used to at ramen restaurants and each restaurant often boasts a unique kind of noodle. There are so many different ways to make a ramen noodle that the same bowl of soup can have a completely different profile with different noodles. The object of the dish is to dip the noodles into the very thick broth to coat them before eating them. The process is a little involved, but the flavors speak for themselves and the dish is well worth the effort, which is actually kind of fun if you’re willing to try something new. Don’t forget about the additional items you can add to the ramen as well. 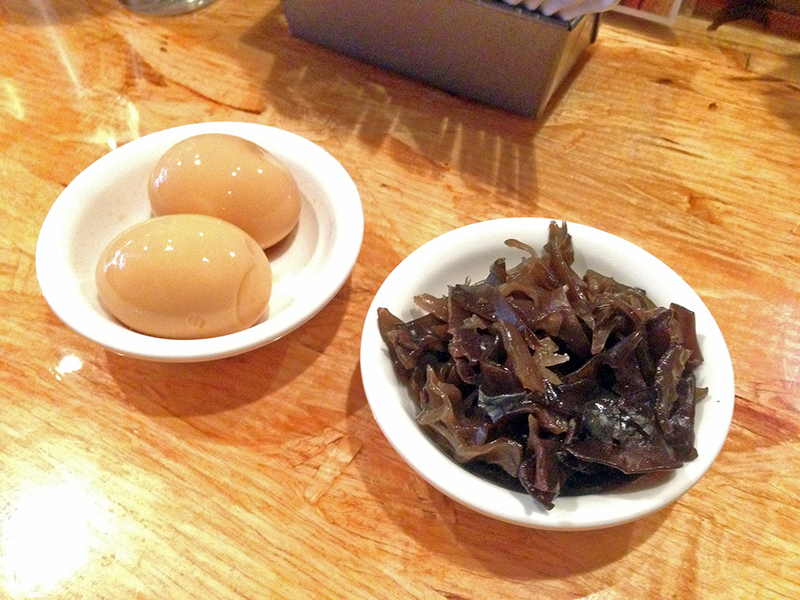 My personal favorites are the Ajitama (soy braised soft-boiled eggs) and the kikurage mushrooms. The egg enriches the broth while the mushrooms add a really great chewy texture to the dishes like a different kind of noodle. 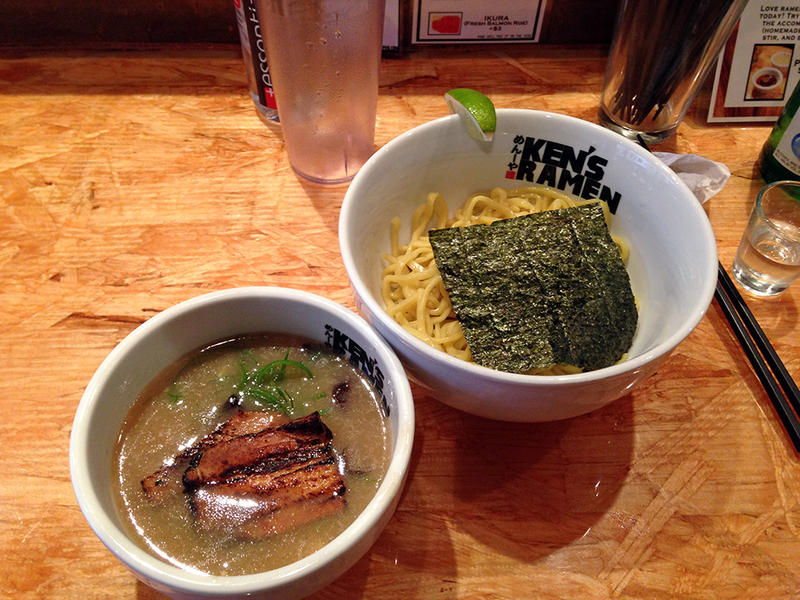 At Ken’s you can find really good, but more importantly unique, ramen made fresh with high quality ingredients. Whether it’s a cold winter day or in the middle of summer, this hearty comfort food is sure to please year round. Highly recommended, but remember that it’s cash only and not easy to spot the restaurant from the street if you haven’t been there before.